Further clarification is being researched but from April 1st 2015 the number 83 will be replaced by number 4a. New timetable information here. To be confirmed by Paul Connelly - N.S Principal Transport Planning Officer. 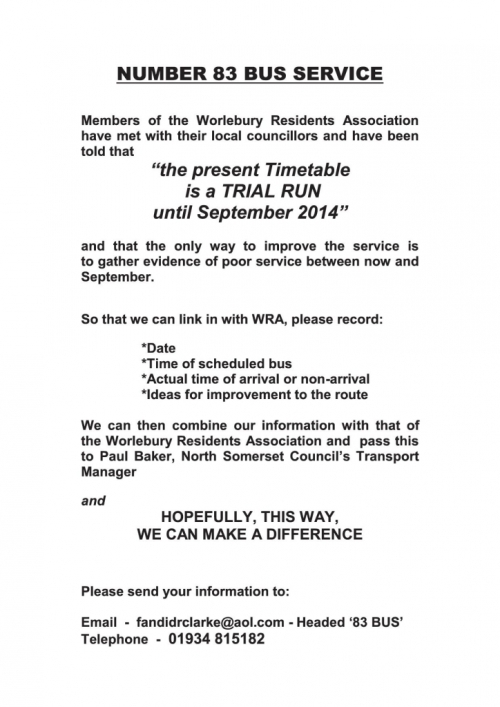 The 83 bus will no longer travel to Worlebury but the route will now include Hutton. It will be an hourly service throughout the day. The 'School Bus' run will be a separate contract. It is anticipated that the service will be served by single deck buses, as the double deckers came into use with the introduction of the 'School Bus' run. Relocation of terminus to a safe location. 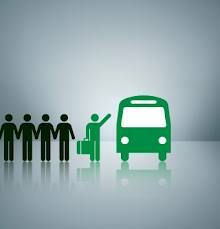 The law relating to reversing a bus with passenger on board - re The Veale. Statement on tickets issued - 'Please be aware that passengers travel at own risk'. The early morning and Sunday service will not be reintroduced as low passenger numbers have indicated there is not a demand for these services. Inclusion of the The Veale is not being considered. Travelling up Totterdown Lane is not being considered. Where Weston Town Councillor Peter Fox (Bleadon Hill Ward) has agreed to attend and meet with all. So a very big 'Thank you' to all who have responded so far and please, please come along to further add your support and voice concerns. Finally, so that the Cafe can be advised of numbers expected, if possible please can you phone I.D Clarke 01934 815182 or email fandidrclarke@aol.com to confirm. Please find attached notice below from ID Clarke and a group of local bus users, on our Number 83 Bus.